The Achilles Point is named after the ship that took down the German pocket battleship Admiral Graf Spee. The lookout point offers a gorgeous view of the Waitemata Harbour and is rare treat if you love to explore scenic places. A number of geological formation along the small hike to St Heliers add to the visit. Looking down from the Achilles Point you can see a rock formation that looks like the bow of a ship while the traditional Maori carvings seen at the point are the highlight. Do carry a camera to capture the views from the point. Do wear sturdy shoes for the hike. How popular is Achilles Point? People normally also visit Kiwi Valley Farm Park while planning their trip to Achilles Point. This place is amazing. A very beautiful view. Just loved it. Great views on a good day out over the Waitmata Harbour. Nice memorial to the men who fought the Battle of the River Plate. Awesome place to see the sun set with a long track along the beach. While the scenery is breathtaking from Achilles Point, the park itself is in disrepair. Considering that a feature of the park is a wooden promenade hanging a couple hundred feet over the beach below, and that, seemingly minor, disrepair feels like a serious safety issue. 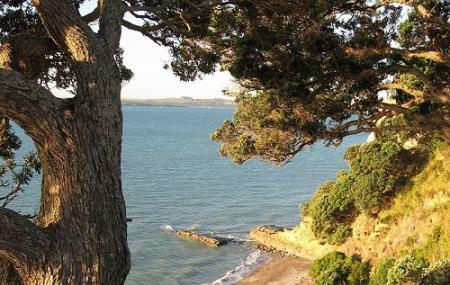 A well laid out visitor lookout point with glorious views of Rangitoto and the small islands. Best viewed on a sunny day in spring when the small islands are still lush green and the waters are sparkling. The area is clean and rubbish free with a nice display explaining the significance of its name "Achilles"